The weather has been surprisingly nice these past few weeks (not that I am complaining) but I would have loved some warning in order for me to get myself prepared and ready. 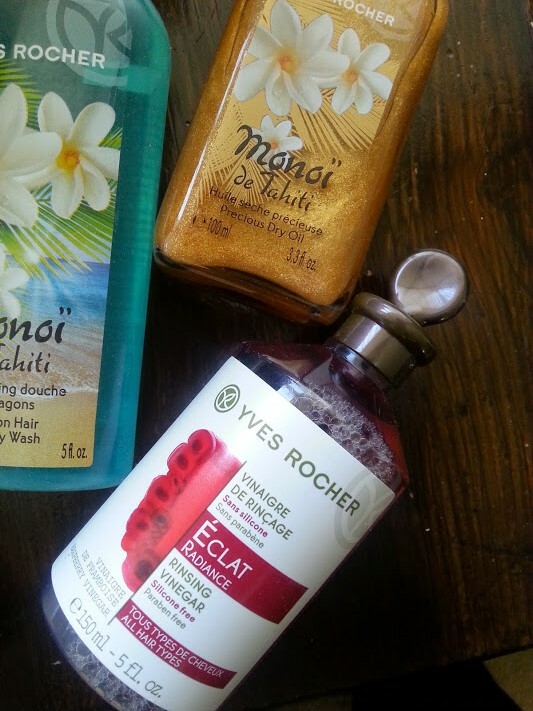 Not to worry because we all still have time to get ready for the 'real' summer months and today I am sharing with you some Yves Rocher products that are perfect for getting you into the mood! This is a shampoo for your hair but not really a shampoo if that makes sense? 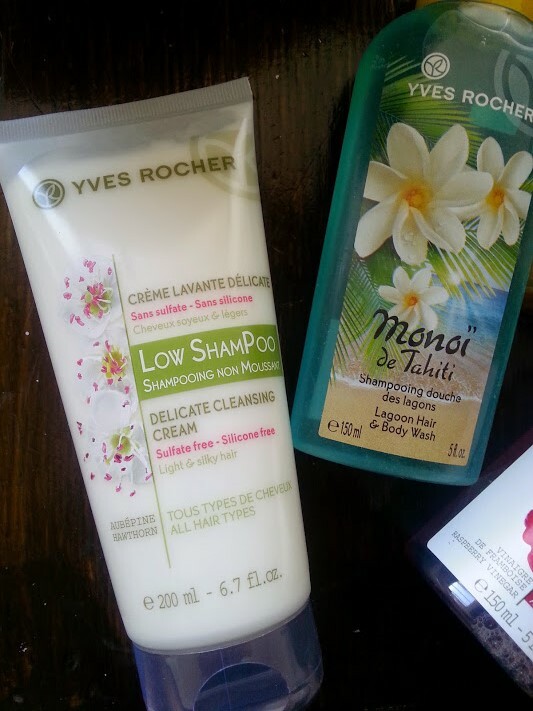 In the beauty world the trend is to use a cleansing cream that works and acts like a shampoo but doesn't foam up because it is there to protect the hair fibres. It is a weird sensation at first because it feels weird to not have a product go all foamy in your hair but after that you do get used it and the cream feels soft on your scalp and more like a conditioner for your hair. I have really thick hair and using something like this worried me but after using a generous amount I found that it cleaned my hair amazingly well. The colour of this wash reminds me of the deep blue sea and makes me dream about being whisked away to some desert island and relaxing by the beach/pool. 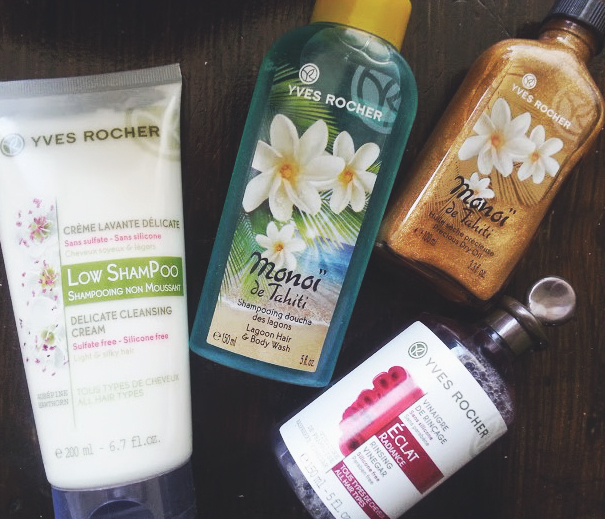 It is suitable to use for both your hair and body but I have only used it so far on my body because it smells so good! It is also great for when you go away because of it being multi-purpose. This one is for all you tanners out there and sun loves. the precious dry oil is formulated to work with that glowing golden tan. In the oil there is small, fine glitters that help to enhance the skin and give you a lovely illuminating look. I have never been the biggest fan of body oils because they can sometimes feel too greasy and heavy, but this is very light and non greasy. This is also because of the oil being paraben and mineral oil free - great for sensitive skin girls like me! I can just imagine using this on my legs after sitting in the sun to give my legs a super model glow! This is a vinegar for you hair, yes I know bizarre but amazing. As per the instructions you apply this on your last rinse before coming out the shower in hope that it leaves you with a natural shine and not a greasy look. I am pretty luckily to have a shine to my hair after letting it dry naturally but when i blow dry it, the shine is non existence but since using this vinegar my hair after blow-drying has a beautiful shine to it and leaves a raspberry scent to the hair even after your shampoo wears away. 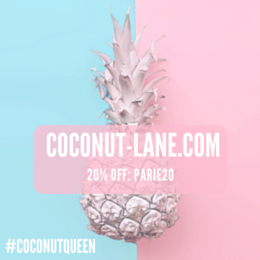 All of these products are definitely the best things you need to get yourself in the mood for summer and get your hair and body ready for it! All four are also great for taking on holiday with you, like mentioned previously they are multi-purpose but also things that you need after a day at the beach.